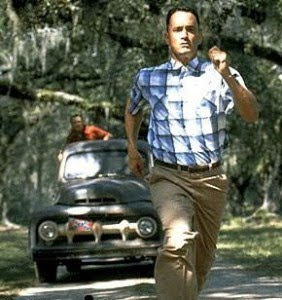 The Drunken Housewife: Run Forrest, Run! I actually got up a little before 6 this morning (i actually beat the alarm) to go for my morning walk. I was so proud of myself for getting up and getting out without waking anybody up. It's still dark outside when I start walking. It rained last night, so as I walk under low tree branches, I get sprinkled with water from the leaves. It's nice, even though it's pretty warm and humid for 6am. I'm walking by the school (which has no trees) and I realize the nice sprinkles coming off the trees is really rain falling through the leaves. I was being rained on and didn't realize it. I am a GENIUS! At this point, it started raining harder, so I had to turn around and run home. I'm sure the running was good for me, but most fat people do not enjoy running and I think I'm one of them. So, what started as a good morning ended with me being wet and running through the rain (with my camera in my hand) like an idiot. It's a good thing there isn't anyone out that early. Although, I'm pretty sure the milkman at the school was laughing at me. He got to witness my realization that it was raining on me and my turning around and bolting. Now that I've made breakfast and got my husband and my oldest daughter out the door, I want to go back to bed. I have a to do list a mile long staring at me, but I'm tempted to hold it over a candle and head back upstairs. Why is it that when one of my plans gets ruined or doesn't turn out just right, I'm so quick to let it change my other plans? It's probably just laziness. Oh well, I guess I'll get started on that list. I had pretty much the same routine over the summer. I actually enjoyed it, but now that it's school time again, I had to change it. Now, it's hard for me to stay up until 10!